Upon setting up a new contest, you will first enter the basic details and graphics. 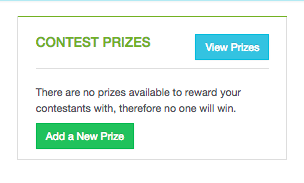 Then, on the specific contest's dashboard under Contest Prizes, click "Add a New Prize" to add prize(s) for that contest. For each type of prize you can set the total quantity available, prize limit (how many times an individual can win each prize), and availability date (Note: set the grand prize's availability date for later in the contest timeframe to encourage continued participation). Here you can also attach prize graphics (created outside of PeopleVine) and text to be displayed to the winner(s).